Notes: Llynclys was situated on the Cambrian Railway (CR) main line that linked Whitchurch and Aberystwyth. The section of line on which Llynclys stood was authorised as part of the Oswestry & Newtown Railway (O&NR) on 26 June 1855 and work began on it on 4 August 1857. By 1860 the section of line between Oswestry and Pool Quay was almost complete. 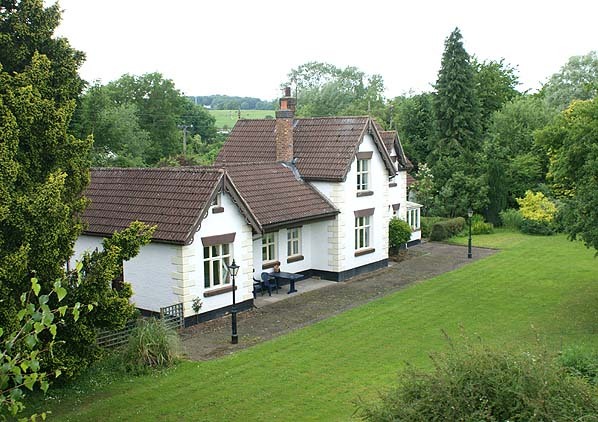 It was inspected on 18 April 1860 by Colonel Yolland who recommended some modifications. 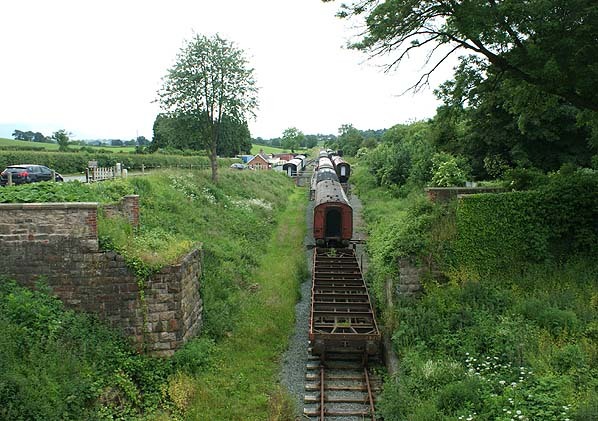 The modifications were carried out and the line opened between Oswestry and Pool Quay on 1 May 1860. The station was located a short distance to the east of its village namesake to the north of what later became the B4396 road. The road passed over the railway on a bridge and the station was immediately to the north of it. At the time of opening the line was a single track railway but there was a passing loop at Llynclys. 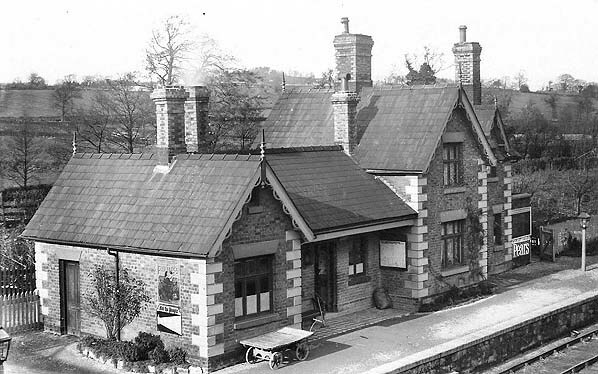 The station building, which possessed both dignity and charm, was on the up side (Oswestry direction) of the line. It consisted of a two-storey stationmaster’s house, both the taller section and recessed section having scalloped bargeboards and finials adorning the gables. The offices and waiting facilities were in a single-storey wing; the end of this range was given a gable and bargeboard and finial to complement the stationmaster’s house, and the section adjoining the house was recessed, its roof extending forwards to provide shelter. Llynclys was also provided with goods facilities. They were located to the south of the road overbridge and were approached by a driveway on the east side of the line. The goods facilities included a goods shed located on the east side of the line, sidings, a weighing machine and cattle pens. To the north of the goods facilities and just to the south of the road overbridge the Crickheath Tramway passed over the CR main line on a bridge. The tramway linked quarries at Porthywaen to the Montgomery canal at Crickheath Wharf. On 1 May 1861 a branch was opened from Llynclys to serve the quarries at Porthywaen that were already served by the Crickheath Tramway. The branch diverged from the main line 18 chains north of the station at what became Llynclys Junction. In the second half of 1863 work began on doubling the main line between Oswestry and Llanymynech and it was completed by 15 February 1864. A down platform (Newtown direction) was provided with a simple wooden waiting shelter. It was reached by a sloping pathway from the B4396 road. The December 1895 timetable showed 6 up and 5 down trains Monday-to-Saturday as shown in the table below. On Mondays there was an extra up train and on Wednesdays an extra down. On Sundays there was one train in each direction. The July 1922 timetable showed 7 up and 7 down trains Monday-to-Saturday. On Wednesdays there was an extra up train. On Thursdays there was an extra down service and on Saturdays two extra down services ran. There was still just one train each way on Sundays. Llynclys became part of British Railways [Western Region] (BR[WR]) at nationalisation on 1 January 1948. By the September 1955 there were 11 up and 11 down trains on the main line Monday-to-Friday. On Saturday there were 10 down trains. On Sunday there was one train in each direction. The level of service remained the same for the rest of the 1950s and into the 1960s. On 1 January 1963 Llynclys passed to the operational control of British Railways [London Midland Region] (BR[LMR]). Three months later the Reshaping of British Railways report (the ‘Beeching Report’) was published. 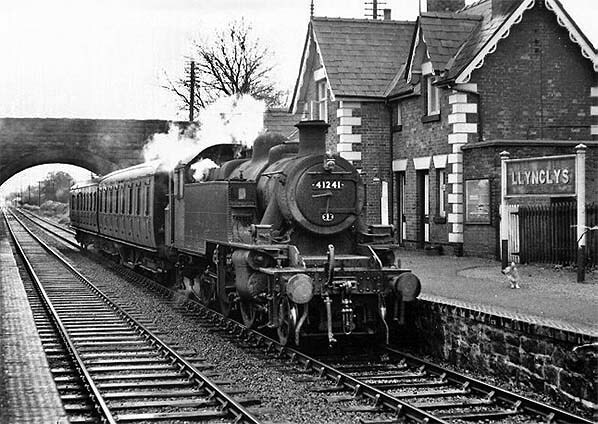 It recommended that the line from Buttington Junction to Whitchurch, and the branch to Llanfyllin should lose their passenger service, and the intention was that the line should close completely between Buttington and Llynclys (including the Llanfyllin branch). The intention to withdraw passenger services was published on 11 March 1964, and the TUCC report on the closure hearings was received by Ernest Marples, Minister of Transport, on 13 July 1964. His consent to the closure was announced on 11 September 1964. On 6 July 1964 Llynclys closed to goods. 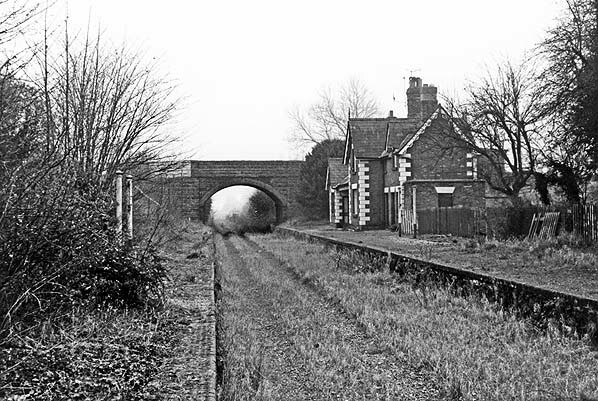 The last trains ran to and from Llynclys on Saturday 16 January 1965 and on Monday 18 January the line through the station, between Buttington and Llynclys Junction closed completely; track-lifting followed later in the year. The station passed into private ownership and, with the exception of the down platform waiting shelter, it survived intact well into the 1970s. At some point the trackbed between the platforms was filled in to create a garden area. In 2001 the Cambrian Railways Trust (CRT) purchased the trackbed of the former CR line from a point just to the south of the B4396 road to Pen-y-Garreg Lane in Pant. In 2003/4 the CRT laid a mile of track and installed sidings at the site of the Llynclys goods facilities. They also built a station which was given the name Llynclys South. In November 2009 the CRT became part of Cambrian Heritage Railways. The Llynclys station building which was located on the up platform seen from the road bridge in 1904. Llynclys station shown on a six-inch scale map from 1874. Llynclys station shown on a 1:2,500 scale map from 1925. Crossing the line just to the south of the passenger station is the Crickheath Tramway. The goods facilities at Llynclys shown on a 1:2,500 scale map from 1925. The goods facilities included a goods shed and cattle pens. 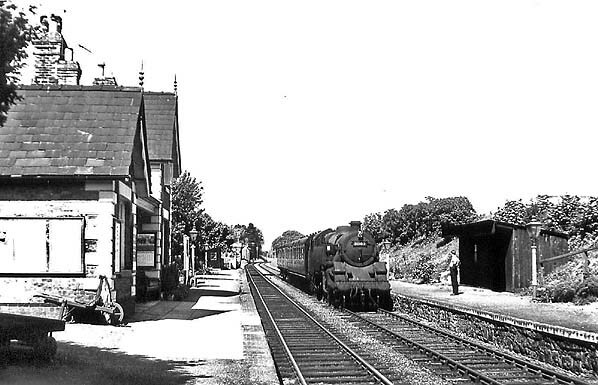 Llynclys station looking south from the down platform in 1956. A local service for Oswestry is seen arriving at the up platform. A view looking north along the down platform at Llynclys station in 1958. The Llynclys Junction signal box can be seen in the distance. 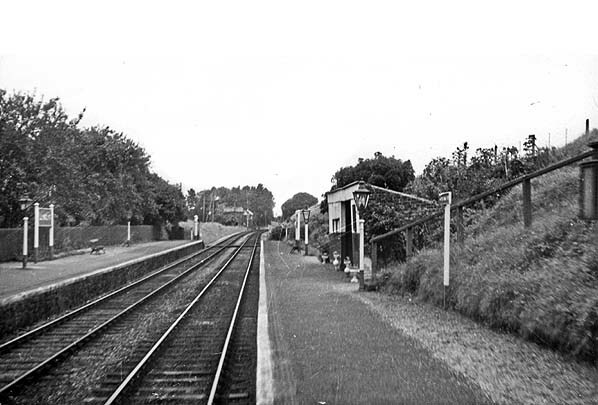 Llynclys station looking north along the up platform in 1963. 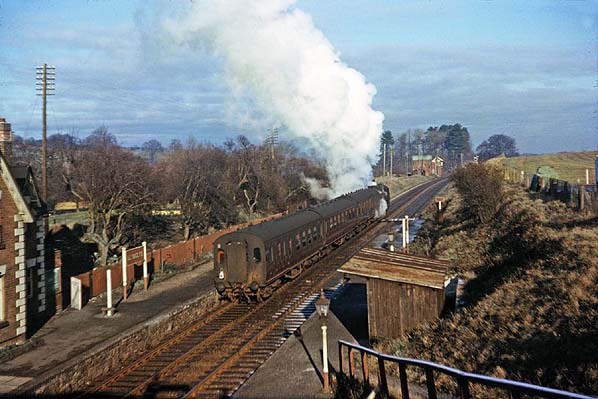 A view looking north at Llynclys station from the road bridge in January 1965. Within a few days the line at this point would close completely. Llynclys station looking south in April 1974. Looking north-west at Llynclys station on 28 June 2013. Cambrian Heritage Railways project to create a tourist line. The bridge abutments in the foreground were originally part of the Crickheath Tramway which closed in 1932.